Built with exhilirating performance in mind, the turbocharged Civic Si Sedan delivers 205 horsepower and a smooth ride. Along with its 1.5-liter turbocharged 4-cylinder, the Civic Si boasts a MacPherson strut front damper system and center mounted exhaust. Drivers will also appreciate the 6-speed manual transmission with close gear ratios and Sport Mode for spirited revs through every gear. Visit Premier Honda in New Orleans, Louisiana to find your Civic now! Honda knows that today's drivers want to stay connected to more than the streets of New Orleans. The new Si Sedan lets you choose between plugging in, streaming, or tuning in. Connect your iPhone® to Apple CarPlay® to receive messages, play your music, or get directions. For you Android™ users, the Android Auto™ will give you these features as well through a 7-Inch Display Audio touch-screen. Ever forget where you parked? Then you're going to love the HondaLink® feature. Pair your compatible smartphone with your new Si and your Civic will save your parking spot for you. Along with its thrilling performance, the new Civic Si Sedan offers a suite of advanced technologies. The Multi-Angle Rearview Camera will help you out of those tight parking spots with a view of what's behind you while in reverse. Honda LaneWatch™ does just what the name implies. When you activate your turn signal, Honda LaneWatch™ takes over the 7-inch screen on the dash to show live video of what is beside you for safe lane changes. To create the soundtrack of your drive, crank up the 450-watt, 10-speaker audio system. Ready to climb in? If you are shopping for a Honda lease deal, look no further than the new Honda Civic Si. Notable features on this model include Projector-Beam Halogen Headlights with Auto-On/Off, One-Touch Power Moonroof with Tilt Feature, and Heated Front Seats. Slide behind the wheel and see what the 205 horsepower can do with a 6500 rpm redline. The Hill Start Assist will get you going on steeper grades. The cabin of the 2019 Civic Si provides ample room, soft but durable touchpoints, and comfortable seating for up to five. Front seat occupants will also appreciate the lightweight Si sport seats with red stitching when powering through the apex and through the chicane. Push the Sport mode button for additional throttle response. 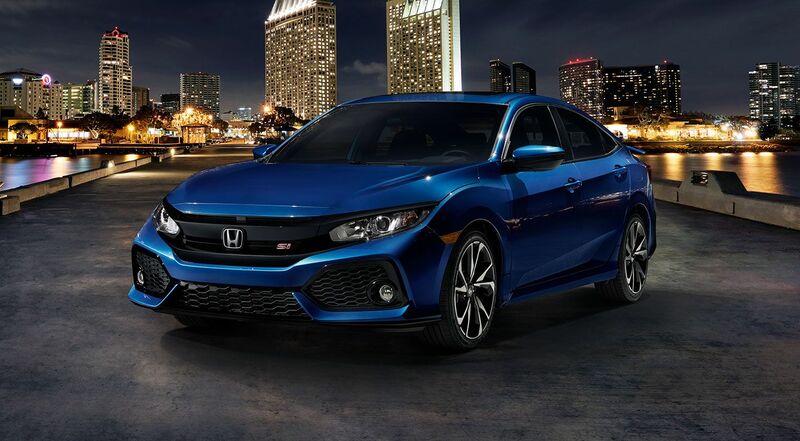 The 2019 Civic Si Sedan boasts an aggressive sport bumper and a menacing gloss black grille framing the red Si badge. Angular body lines and sophisticated style abound on this new four-door sedan from Honda. If you drive a new Civic Si, everybody will be behind you. So, we might as well touch on their view. Signature C-shaped taillights and Si badge accent the rear of the Civic Si. The wing spoiler and center outlet exhaust deliver unmistakable attitude.